The SVC100 is a standalone controller utilized for operation of the SV200 and SV100 valves. This highly functional control system permits programming of the motor speed to the dispense valve, air pressure to the pre-packaged syringe, and a variable auger reverse time for clean cycle stops. The SVC100 is equipped with a foot pedal actuator for handheld processes. The SV200 Auger Valve is ideal for dispensing 2-part, premixed epoxies and pastes in dot and bead patterns. The SV200 can dispense dots as small as 0.020” in diameter and features a quick release to separate the motor assembly from the auger for easy cleaning of entire fluid path. The SVC100 Servo Controller provides customized valve settings for handheld or automated applications. The SV100 is ideal for dispensing all medium to high viscosity pastes, epoxies, and abrasive compounds in dot and bead patterns. 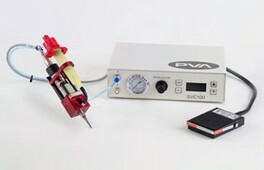 The SV100 can dispense dots as small as 0.020” in diameter. A dedicated servo controller, the SVC100, permits customized valve settings for handheld or automated applications. The SVX is ideal for dispensing all medium to high viscosity pastes, epoxies, and abrasive compounds in dot and bead patterns and can dispense dots as small as 0.005″ in diameter.